mg2010 - The Future of the World: Buzz RightsYear presents "TO EQUALITY AND BEYOND"
Greetings citizen and welcome to Star Command recruitment. Here at Star Command you are able join our parade group or assist in raising funds so we can stage this endeavour. We need to raise $2,000 through our on-line raffle. You will be able to purchase tickets or if you are a business wishing to support us you can donate prizes. All businesses will be recognized for their assistance. 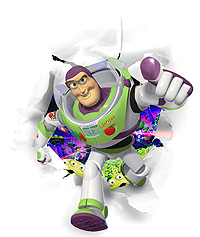 This parade entry will have Buzz RightsYear riding in his Star Command Intergalatic Spaceship EQUALITY ONE, surrounded by an orbit of about 40 three eyed Little Green Men as depicted in Pixar’s animated Toy Story films. 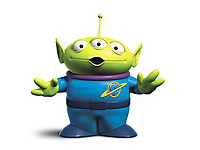 You can become an one of the LGM by completing Alien Registration. Toy Story 1 & 2 in 3D is in cinemas at the moment before the release of Toy Story 3D in June 2010, so this is a very timely parade entry. We will use a "LASER BEAM" (see example video here) which can be programmed for specific patterns or text. The "LASER BEAM" will be mounted in a gun turret on the spaceship and will project Buzz RightsYear's catchcry, "TO EQUALITY AND BEYOND..." onto the facades of the buildings bordering the parade route then “to infinity and beyond”. This very conspicuous way facilitate the promotion of our theme of equality in an attention grabbing, innovative and effective way to the largest possible audience. Of course the success of ethel yarwood enterprises is due to the contributions of the many Friends of Ethel. We would like to sincerely thank and acknowledge those who have dedicated their valuable time, money and resources to this project. ethel yarwood enterprises has been contributing to the Sydney Gay and Lesbian Mardi Gras since 1988. That's 23 years of experience and in that time we have collected 8 parade awards for our efforts. Last year we staged the successful Surry Hillsong parody which received much media coverage. A 20 year (1988~2008) retrospective video of our work compiled by Ian Gordon of Atlas Worx is also available for your viewing pleasure. A podcast of an interview between Melbourne radio station 94.9 JoyFM's Dean Beck/James Findlay and Kabi regarding some of the more memorable parade moments and other confronting ethel yarwood enterprises' community projects. You can also read the keynote speech for the 2010 Sydney Gay and Lesbian Mardi Gras Festival launch in Victoria Park for Fair Day, 21st February 2010 delivered by Sue-Ellen Cox/artistic director of ethel yarwood entereprises.